What a difference a few years makes. On June 15 in 2011, Danton Heinen had to watch his hometown Vancouver Canucks lose the Stanley Cup on home ice to the Boston Bruins. On Feb. 17, 2018, he’ll be returning to Vancouver as an integral part of this Bruins team. Now with the Bruins, Heinen has been one of the team’s best players. 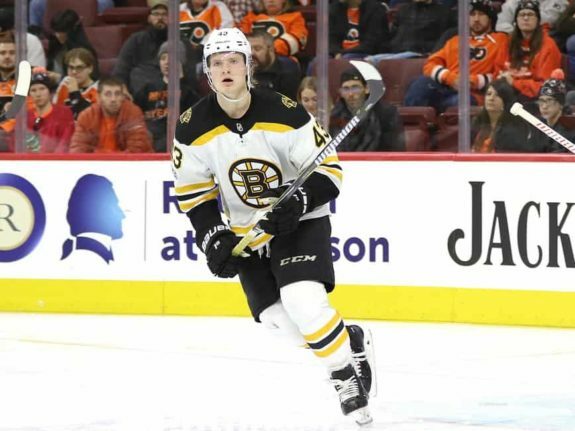 While it’s easy to look at Heinen’s production as a rookie and compare him to other first-year players around the league, the fact that Heinen is fourth on the Bruins in goals (12), tied for third in assists (26) and fourth in points with 38 in just 51 games makes it clear that he is more than just a rookie. Averaging 15:44 of ice time a game and getting consistent power play time, Heinen’s production this year has been a pleasant surprise for many. While there was a distinct chance that Heinen could play a role this season, nobody could have expected him to make such a big impact. Between his ability to play up and down the lineup, his ability to play on the power play, shorthanded or just his mature demeanor on the ice, Heinen has proven that he’s an NHL player and he isn’t going anywhere. Despite his place on the Bruins, however, there’s still no denying Heinen’s roots to Vancouver. It was the center of attention when he was talking to media ahead of Saturday’s game. The obvious narrative heading into any Bruins versus Canucks game always surrounds the 2011 Stanley Cup Final. It’s a game that will forever link these two teams and will undoubtedly be talked about for decades. With Heinen being from Vancouver and playing for the Bruins, however, the narrative has expanded. Growing up so close to the team, Heinen was naturally drawn to the Canucks as a child. It makes sense then that Heinen went to so many games as a kid, especially given the fact that his parents have been season ticket holders of the Canucks since the year Heinen was born, 1995. A fact that will make this experience even better for him when the puck drops on Saturday night’s tilt. While Heinen is expecting 50 or more friends and family members to be at the game, that number could be significantly larger, according to his mother Veronica. Fortunately for Heinen, however, he may have only had to pay for about 10 tickets out of the bunch. When the puck drops Saturday, the narrative of Heinen’s roots to the Canucks will have to take a backseat to what really matters. While it’ll be a cool experience for Heinen to play in front of his friends and family for the first time, he knows all that matters right now are wins. Every single game counts and that fact isn’t lost on any member of this Bruins team. Showing that they can compete with some of the best in the league, the Bruins have risen to the top of the league’s standings, sitting in third place just three points behind the Tampa Bay Lightning with three games in hand for first in the league. The ultimate goal for every team is a Stanley Cup victory. With the way these Bruins are playing, it would be hard to argue against them being the favorites for this year’s title. It comes down to the Bruins playing well every game, regardless of who is in their lineup and who they’re playing. Every player in the lineup is tasked with carrying their load and nobody has proven to be dead weight in the last few months. 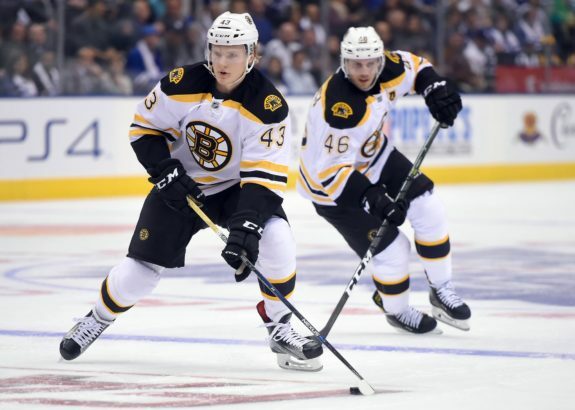 While that may be harder for rookies to do on a consistent basis, Heinen has shown throughout the entire season that he can be relied upon to play in any role that is given to him. He may not be the fastest or most skilled player in the world, but the sky is the limit for Heinen due to his hard-working nature. 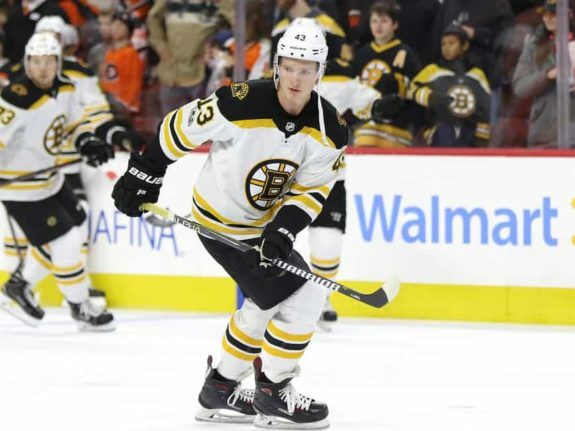 A smart hockey player, Heinen has all the makings of a top-six player despite playing in just his first season in the league after being a fourth-round pick in 2014. The fact that he’s playing almost exclusively on the Bruins’ third line this season is a testament to how good and well-rounded this team has been for the majority of this season.